Details: Stop by Lady Jay’s Brooklyn any and every Wednesday from 6-8pm. Introduce yourself to Booze & Yarn founder Corinna Mantlo behind the bar and settle in for a booze craft session. For all beginners: Be sure to bring an easy to work with ball of yarn and needles. We recommend a light color (it’s a dark bar) and a plain yarn (like a thick wool) as slippery, thin yarns can be hard to work with at first. For needles, go with a larger size like an 8 or 10 straight needle. Be sure to let your local yarn store know you are a beginner and they will help you select a good first timer kit. Your first night, you will be casting on and working on a practice scarf to get your skills down. For intermediate & Advanced knitters: Just bring your lovely selves and whatever project you are working on. We will be on hand for questions, tips and moral support. The skinny: Booze & Yarn is open to all (over 21 please as it’s a bar), and is a free, informal class and social circle for knitters of all levels. The entire group helps one another to improve their skills and bond over what else…but, booze and yarn. Cine Meccanica: Stick around after Booze & Yarn for Cine Meccanica at 8pm to continue knitting and mingle with the local motorcycle and hot rod community for free vehicular films. You’d be surprised how many knitting bikers there are! Cause everything’s better with gin! Booze & Yarn is a free knitting group that meets weekly . The goal is to promote the tradition of knitting and all craft, as a collective; sharing ideas, techniques and encouragement, while teaching those new to the craft. This is an idea that seems to have been forgotten. The group is free to all, as a reminder of community in a city ever changing. There are and always will be a part of NYC that cannot be bought or white-washed. As a New Yorker born and raised, this is my way of giving something back to the community, and has been going strong since 2002. 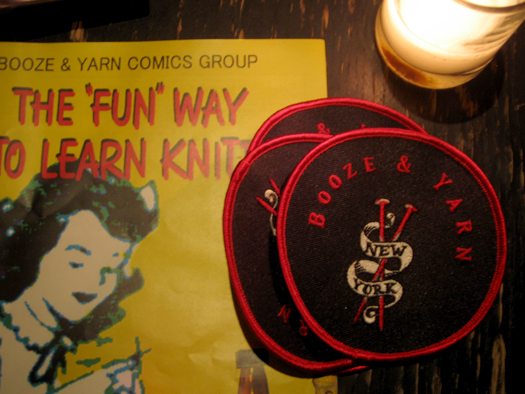 Booze & Yarn is involved with several charities as well. I’ve been practicing the cables slowly for over a year and I still drop stitches in between. Can’t wait to you join you guys again. I see you moved over to Otto’s Shrunken Head on Tuesdays. That’s great because Wednesdays were impossible for me to make it to. I might drop by next week with company. Thanks so much for introducing me to the world of knitting! !